Find a Leader willing to take on the implementation and maintenance of a new security ministry. Your team leaders will need training to properly create this ministry. They can start training TODAY! Hedge provides an easy to follow program specific to the implementation and maintenance of a Biblically based security ministry that will not interfere with the Cause of Christ! Simply plug your leader into our program and your church will be well on the way to improving their security posture. Establish a volunteer security ministry team made up of your members. Preferably, a few of these team members should be licensed to carry weapons. These armed members need training in de-escalation techniques and use of force. This training is available on our site TODAY! 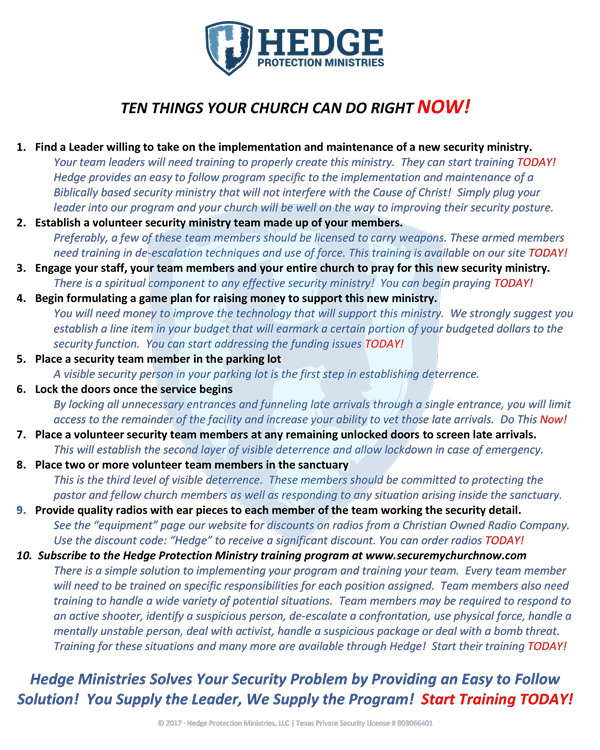 Engage your staff, your team members and your entire church to pray for this new security ministry. There is a spiritual component to any effective security ministry! You can begin praying TODAY! Begin formulating a game plan for raising money to support this new ministry. You will need money to improve the technology that will support this ministry. We strongly suggest you establish a line item in your budget that will earmark a certain portion of your budgeted dollars to the security function. You can start addressing the funding issues TODAY! A visible security person in your parking lot is the first step in establishing deterrence. By locking all unnecessary entrances and funneling late arrivals through a single entrance, you will limit access to the remainder of the facility and increase your ability to vet those late arrivals. Do This Now! Place a volunteer security team members at any remaining unlocked doors to screen late arrivals. This will establish the second layer of visible deterrence and allow lockdown in case of emergency. This is the third level of visible deterrence. These members should be committed to protecting the pastor and fellow church members as well as responding to any situation arising inside the sanctuary. Provide quality radios with earpieces to each member of the team working the security detail. See the “equipment” page our website for discounts on radios from a Christian Owned Radio Company. Use the discount code: “Hedge” to receive a significant discount. You can order radios TODAY! There is a simple solution to implementing your program and training your team. Every team member will need to be trained on specific responsibilities for each position assigned. Team members also need training to handle a wide variety of potential situations. Team members may be required to respond to an active shooter, identify a suspicious person, de-escalate a confrontation, use physical force, handle a mentally unstable person, deal with activist, handle a suspicious package or deal with a bomb threat. Training for these situations and many more are available through Hedge! Start their training TODAY! Hedge Ministries Solves Your Security Problem by Providing an Easy to Follow Solution! You Supply the Leader, We Supply the Program! Start Training TODAY!